A native of Eugene, OR, Loomis has a degree from the University of Oregon and a master’s degree in sports administration from Wichita State University. First met Mickey in 1997 when he was an executive with the Seattle Seahawks (1983/1999) and I was the Director of Sales for Sports 2000. My responsibility was to maintain and support the Hawks expert System named the GridIron 2000 (Windows 95) used for NFL game planning. 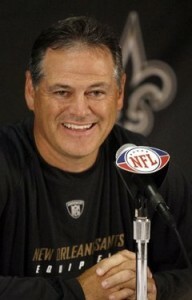 Mickey was hired by the Saints in 2000 and promoted to General Manager in 2002, finally earning the additional title of Executive Vice President later that year. The departments under his direction include coaching, player personnel and scouting, salary cap management, contract negotiations, athletic training, equipment, video and communications. Humbly asking the defending NFL Super Bowl championship GM any question about sports technology I could think of was a real privilege. Out of respect for him, I did not ask about the camera and video technology that was part of the vicodin lawsuit story earlier this year, however, I did let Mickey know that I had drafted Saints quarterback Drew Brees with the 4th overall fantasy football pick the night before. Here’s to hoping that Drew stays healthy and has another terrific statistical NFL season! Brees was signed by Mickey as a free-agent in 2006 coming off an injury to his shoulder and has now for more than 4,000 yards each season with New Orleans. He needs 3,437 yards to break Archie Manning’s franchise record of 21,734 yards passing. Brees is already the Saints’ all-time leader in TD throws. I wondered what Mickey thought about fantasy football so I asked him. He responded by saying that “it’s popular, especially in a participatory way.” He does not pay much attention to fantasy sports but is onboard with why fans around the globe love playing. Mickey mentioned that the league is pushing forward with a new fantasy football game with video, see http://www.nfl.com/fantasy. Several weeks ago the ESPN show ‘Champ Camp’ with Jon Gruden featured Drew Brees and Head Coach Sean Peyton. Mickey had seen the episode and enjoyed it too. Gruden was sitting at a table with these guys breaking down video. Football X & O analysis have come a long way since 1997. Champ Camp is absolute must watch TV for a Sports Techie. Champ Camp video via YouTube and ESPN. Next, I asked Mickey about a recent NY Times Blog by Brian Burke with Fifth Down and Advanced NFL Stats, titled; “Why passing is more important than running.” He had not read it yet. I told him the article did a nice job detailing some complex NFL concepts and philosophies. Read the NY Times article link. Naturally, I wanted to know more about Systems. The Saints have developed proprietary programs that can be customized with variables and used for scouting, player personnel, salary cap management and the draft. Mickey is an accounting major and enjoys working with spread sheets. The Saints video Systems are used for College and Pro Scouting. His coaches still use MS Power Point to help with game analysis and game planning meetings. We had history together over two Seattle Seahawks seasons working with the GI2000 game planning System. 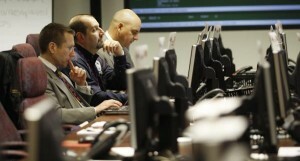 I was eager to find out more about the 2010 Saints game planning operations. I asked Mickey if game planning technology had vastly improved in the NFL since the 1997 and 98’ seasons. Mickey exclaimed that technology had improved “by leaps and bounds.” He added that the Super Bowl security was super Sports Techie. 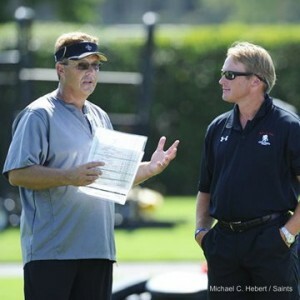 Coaches Sean Payton and Gregg Williams are the Saints offensive and defensive coordinators and call the plays. Since 2006, the Saints have led the NFL in offense in three of four years and were fourth in 2007. During that time, Brees has completed 66.8 percent of his passes for 18,298 yards – the highest four-year yardage total in NFL history. In 2008, he joined Dan Marino as the second player in NFL history to eclipse 5,000 yards passing in a season. Brees’ 5,069 yards fell 15 yards short of Marino’s single-season record 5,084. Training Camp is about being “face-to-face,” explained Mickey. The fans, community and organization bond in a special way. This year, ‘Who Dat’ is out and “Our Time’ is in for the Saints. Trainging camp link. 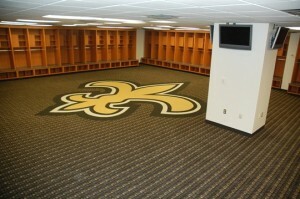 The Saints have a modern Indoor practice facility that offers relief from the intense New Orleans heat and humidity. They play home games in the Superdome. I hope to ask Mickey more detail about the Saints training facilities and products they use at another time. I mentioned to Mickey that two of my recent Blogs about Schutt Sports and Easton Hockey helmets both touched on concussions. Mickey said the league has made lots of advancements in this area. He confirmed that new NFL Posters are hanging in the locker rooms and discuss concussions, related symptoms and what players can do if they are confused or suffering. Mickey said he understood the issues and felt that technological and medical advancements are helping to deal with this serious problem. If Special Teams are the 3rd team then the IT department is the 4th team. Mickey’s previous career was here in Seattle; as a result, he was constantly surrounded by the world’s latest and greatest technology. Therefore, Mickey understands the value of having a solid IT department that operates, integrates and codes the servers, computers, hardware, software, networks, cameras, etc. for the good of the team. Mickey mentioned that the NFL has a small lag with upgrading tech and that league technological changes have been slower than Seattle’s fast-paced, upgrading ways. He supposed in the end that was probably good. Communication tools Mickey uses the most are e-mail and his Blackberry. He does not use Twitter, Facebook, LinkedIn, YouTube or My Space to communicate. Mickey regressed back to 2005 and Hurricane Katrina. He said technological tools were critical for communication before, during, and especially after, the devastating storm. Katrina info link. The NFL Network will air a special on Sept. 8th named ‘America’s Game: 2009 New Orleans Saints’ with Brad Pitt narrating. The special gives a good sense of how far the Bayou region and football team have come in terms of bouncing back since 2005’s natural disaster, culminating with their incredible Super Bowl win over the Indy Colts. Learn more here. Saints Fans go Wild on Bourbon Street via YouTube. It was surprising to find out that Mickey is not into using Social Media. He has four children and a wife who must tug on him via these channels. I follow the Saints Twitter account here. Next question to Mickey was about technology and children. I was curious whether the league and Saints are embracing this connection 100%. He said “yes.” The NFL and Saints Youth programs are both tech and kid friendly. 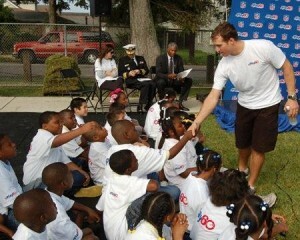 The Saints youth programs are here, Play 60: Play 60, and USA Football: USA Football. There was a terrific USA Today article this past week about the challenges the League and teams face with home games hassles (like traffic) vs. sitting at home (in comfort) while watching the DIRECTV and Red Zone packages on a slick media system using DVR to control the video feed. I asked Mickey where he stood with the ‘Superdome or Home’ fan viewing issue. He said that watching football games from your house and the stadium have both improved by “leaps and bounds!” USA Today article. Mickey and the Saints are super Sports Techie. Thanks to Mickey and the team for taking “Our Time” to talk together about sports technology. See ya when I see ya Sports Techie. Colts will be ready for the on-side kick this season!